The Massachusetts Joint Committee on Public Safety must make a decision on the extreme risk protective order bill, H.3610 by Sunday, April 15th. You still have time to email your representative with your support of the bill here. April 15th (Sunday) – Public Safety Cmte reporting deadline for ERPO bill H3610. April 28th (Saturday) – Gun Violence Prevention Advocacy Training at Boston University. April 28th (Saturday) – Framingham Police Department Gun Buy Back. May 13th (Sunday) – 22nd Annual Mothers’ Day Walk For Peace in Boston. June date TBD – Cambridge Gun Buy Back. June 2nd (Saturday) – National Gun Violence Awareness Day. Sept 23rd (Sunday) – Concert Across America to End Gun Violence. 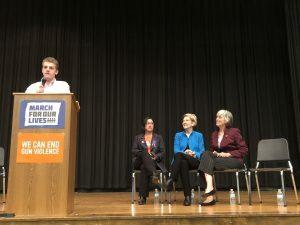 Town Halls: Over the weekend, students across the nation put on the Town Hall for Our Lives. In Massachusetts students partnered with Stop Handgun Violence and hosted events for 8 of 9 congressional districts, by hosting events in Lowell, Pittsfield, Millbury, Boston and Natick. Over twenty-five elected officials attended these events statewide, including US Senator Elizabeth Warren and US Congresspersons Katherine Clark, Mike Capuano, Stephen Lynch and Jim McGovern. Read more about the national effort here or the local effort here. Senator Markey and MA Attorney General Maura Healey also held previously scheduled gun violence focused town halls on Sunday. Assault Weapons Ban: Attorney General Maura Healey won a Federal court case defending Massachusetts assault weapons ban. You can read the AG’s press statement here and read additional news coverage here. In Vermont, advocates have successfully advanced three gun violence prevention bills from the state legislature and they currently await signature of Governor Phil Scott. The Governor has announced his support of these bills that include raising the age of firearm purchase from 18 to 21, requiring background checks for private gun sales and a bump stock ban. In Maine, lawmakers are now considering their own state level extreme risk protective order bill. You can read more about it here. In Rhode Island, a state level extreme risk protection order bill has been filed and passed the House Judiciary Comittee just hours ago. The RI Governor appointed two chairs, an emergency room doctor and a former State Police Major to co-chair the new “gun safety working group”, read more about the group and its purpose here. Maryland’s Extreme Risk Protective Order bill has passed both the House and Senate and is on to a conference committee. Governor Phil Murphy and Attorney General Gurbir Grewal of New Jersey announced actions they will take to keep the public informed about gun crimes and the sources of weapons, you can read their statement here. Looking to join the club, Ohio has filed their own extreme risk protective order bill. You can read more here. Michigan’s top court will be hearing a case gun owners filed in opposition to local schools’ firearms prohibitions. It appears that the NRA may have more Russian contributors than it first acknowledged further adding to the Russian/NRA ties that others have identified. In the latest series of gun industry struggles, Sturm Ruger cut 700 jobs in the last year.